Therapeutic grade essential oils not only help to calm your anxious mind but also improve your physical health in a natural way. While a large capacity diffuser helps to keep your home refreshed with essential oil, a necklace diffuser is a more convenient choice when you leave the comfort of your home. Essential oil necklace diffusers are what you get when ancient natural healing meets modernly styled jewelry. Not only does it look great on you, but you’ll enjoy the therapeutic benefits as you inhale vapors of essential oil as you’re going about your daily routine. Aromatherapy is believed to evolve from early civilizations of Egypt and China. Studies have shown that essential oils extracted from different plants have distinct therapeutic qualities. They are known to be effective in helping to calm anxiety or as a general mood enhancer. But there are more reasons for you to be wearing an essential oil necklace diffuser. Aromatherapy on-the-go – You don’t have to confine yourself to your home to enjoy the benefit of aroma healing. A necklace diffuser allows you to feel comfortable even when you’re not at home. It Simply Looks Beautiful – There’s no harm wearing a piece of elegantly made jewelry and getting the best of aromatherapy at the same time. The fact that you’re wearing a stylish necklace can make you feel better too. Hassle Free – You don’t have to deal with pouring water to your regular diffuser and adding essential oil droplets. And you save on electricity too. Great For Workplace – Sometimes, it’s just not possible to install a typical diffuser in your workplace. A necklace diffuser is the best alternative to helping you to stay focused and not get overwhelmed by stress in your job. Aromatherapy works by inhaling the scent of natural plants and having the molecules of essential oil absorbed to your body. That results in a soothing experience of your body, mind, and spirit. A necklace diffuser helps in diffusing the essential oil at a short range. You’ll find that necklace diffusers often consist of a necklace and a locket. The necklace is worn on your neck, just like what you regularly do with a normal necklace. The locket or pendant is where drops of essential oil are placed, usually on a pad. The scent of the essential oil will permeate the air gradually. Depending on the quality of your essential oil, the fragrance will normally linger for 2 – 5 days. A necklace diffuser is a piece of aromatherapy jewelry that comes into contact with your skin. You may even wear it for hours on regular basis. While cost is a valid consideration, there are other factors that you need to take into account, before buying a necklace diffuser. Material – A surgical quality 316L stainless steel necklace is the best option when it comes to choosing the necklace. It doesn’t get corroded easily and cleaning it is a simple process. 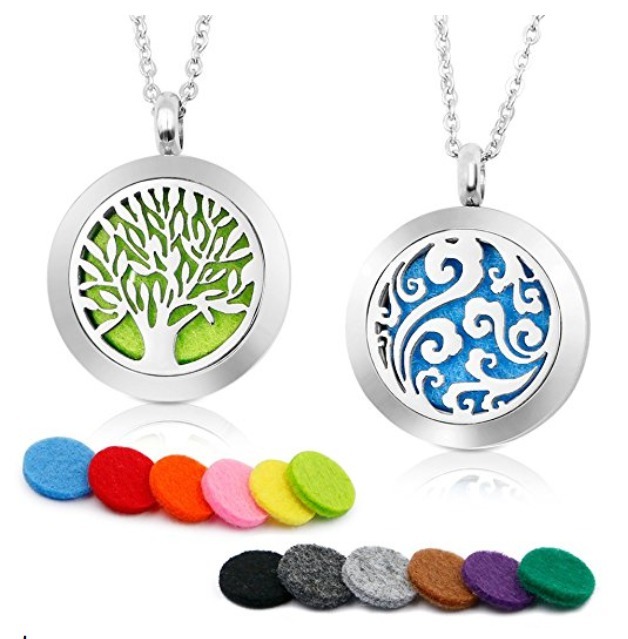 Hypoallergenic – Most necklace diffusers will advertise their material as hypoallergenic. This implies that you’re less likely to suffer allergic reactions from wearing the necklace. But bear in mind that there’s still a small percentage of nickel being used in 316L stainless steel and you’ll want to practice caution if you’re allergic to nickel. Size – You wouldn’t want to end up with a necklace diffuser that is too tight and short for comfort. Always check the length before buying. Construct – It’s great to have a necklace diffuser that looks elegant on you. But you need to be sure the essential oil does not come into contact with your clothes easily. Look for lockets that have its back covered to prevent that from happening. With hundreds of essential oil necklace diffusers available, searching for the right one can be overwhelming. 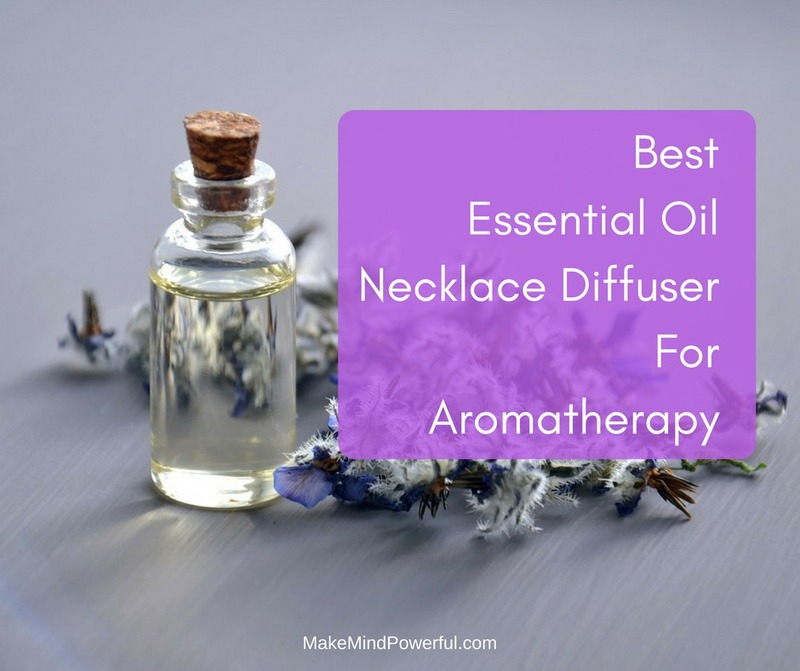 I’ve prepared this guide to help you get the best necklace diffuser to work with your favorite essential oils. Material: 316L Surgical Grade Stainless Steel. This essential oil necklace diffuser by mEssential comes with a beautifully crafted tree of life pendant. It is hypoallergenic and made from surgical grade 316L stainless steel. This ensures that the diffuser necklace will be long lasting despite regular usage. This special set of necklace comes with four bottles of natural essential oil to let you get started with personal aromatherapy immediately. You’ll have Lavender, Peppermint and two special blends (Zen and Calm) of essential oil to try out. Of course, if you already have your favorite essential oil at home, you can only choose to purchase only the necklace. But you’ll be missing out the stylish box that is perfect for gifts or an elegant addition to your decor. The necklace is 24″ in length and you’ll find 6 refillable pads in the box. With steel magnets and solid backs on the pendant, you do not have to worry about the essential oil staining your clothes. The pendant is skillfully crafted that you wouldn’t feel any sharp edges irritating your skin. With solid necklace and securely design locket, you’ll find this high-quality diffuser necklace a great gift for both yourself or loved ones. You can use the different essential oils for their unique properties. If you’re struggling with sleep, placing a few drops of lavender essential oil on the pad will help you out. Elegant gift box when you buy the complete set. Some buyers do not like the chain. 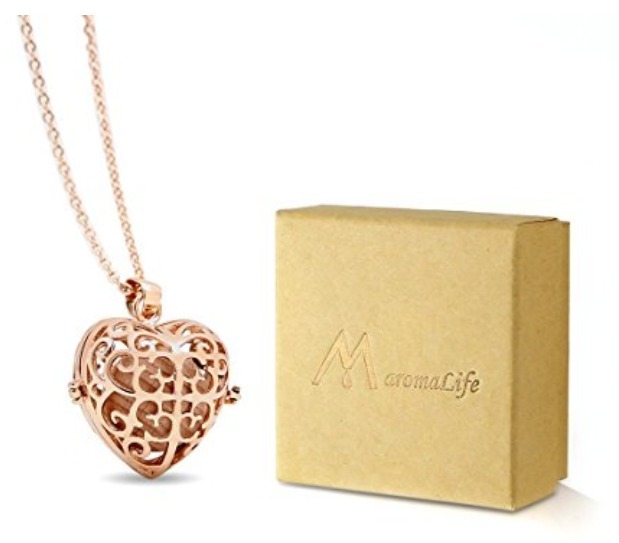 This heart-shaped aromatherapy diffuser necklace by Maroma life uses 100% nurture wooden balls to absorb and diffuse essential air into the air. The wooden balls absorb the essential oil easily and emit a blend of natural wooden fragrance. You can use the necklace knowing there’s little risk of allergic as it’s made of 316L surgical grade stainless steel. It’s great for people with sensitive skin. This elegant piece of aromatherapy jewelry will shine for a long time as you wear it around. The adjustable 24″ necklace makes it easy to fit on your neck. The locket has a magnetic and lobster latch to secure the wooden ball. You wouldn’t have to worry about the wooden ball falling off as you walk around in comfort. The diffuser necklace is shipped with an elegant gift box. It’s one of the best gifts for your loved ones, especially if they are deeply interested in aromatherapy. Else, you can use it to relieve pent-up stress anywhere you are. This is a premium necklace diffuser that does not look cheap and ideal for aroma healing. The golden heart shaped pendant will look great on the wearer. With proper care, it will not fade in a long time. Magnetic and lobster clip for the pendant. Made from hypo-allergenic, stainless steel. The diffused wooden ball easily inserted. The chain broke in some cases. If you fancy a cute looking necklace diffuser, look for the ones sold by Treehouse Premium Brands. Not only does it look unique, both the pendant and the chain are made of stainless steel. The pendant is 1.25″ in diameter and you can open it from the side to replace the felt pad. It’s best practice to remove the felt pad before adding drops of essential oil to prevent dulling the locket in the long run. 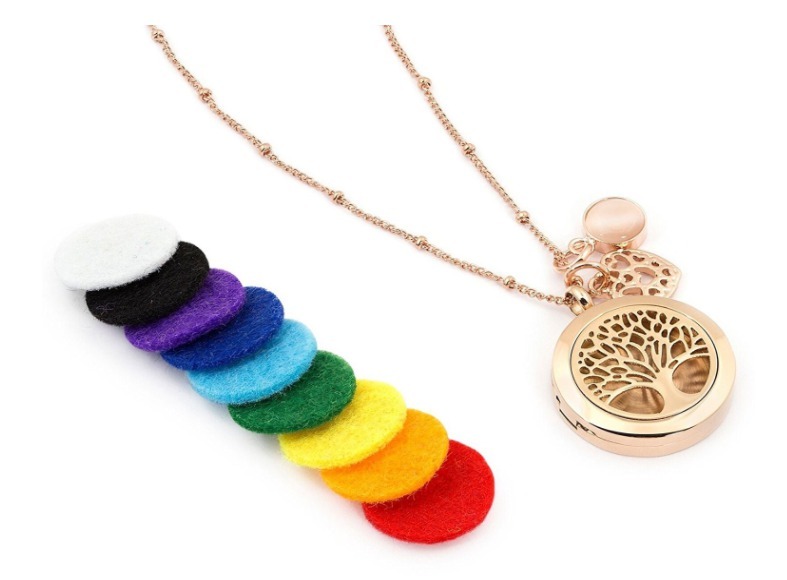 The necklace is shipped with 5 colored felt pads. You can use each for various type of essential oils. There’s no need to discard the pads as they are reusable. Not only you’ll get the therapeutic effect of essential oils, but you’ll look stylish when you slipped this 24″ necklace diffuser onto your neck. It’s a cute and convenient way to enjoy aromatherapy on the go. If you’re a pet lover, you’ll prefer this diffuser necklace over others. If paw shape pendant is not for you, there are other equally beautiful options to choose from. What’s important is that all of them are equally effective in getting the aromatic fragrance to you. A few drops of essential oil is usually enough to last for the whole day. A favorite amongst kids and animal lovers. Does not come with a storage pouch. 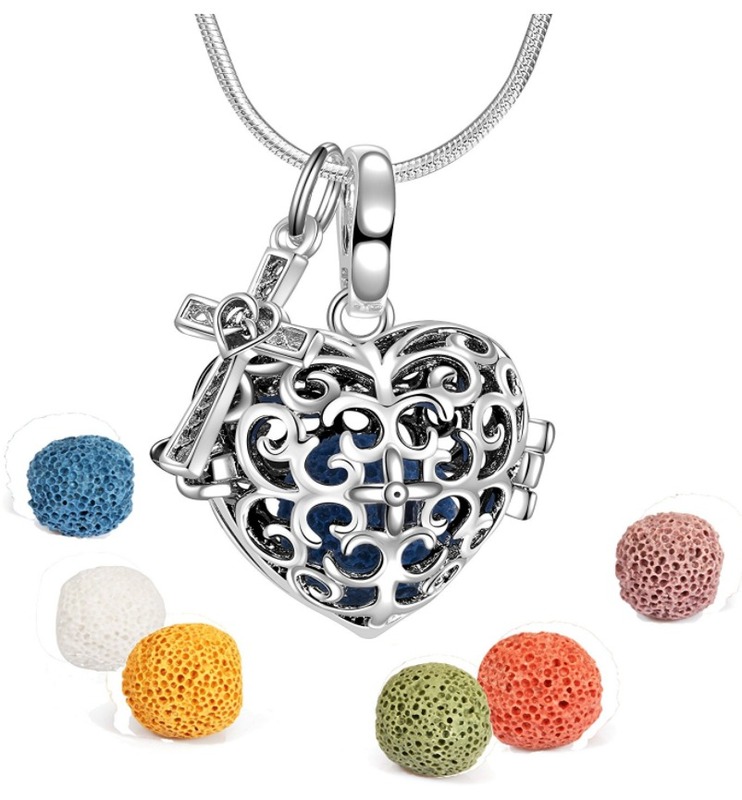 Lava stone is known to be the best diffusing method in a necklace diffuser due to the porous texture. This aromatherapy necklace comes with two lava stone that allows the essential oil to easily seep in and disperse into the air. The pendant itself has a flower design and is secured to a 316L surgical grade stainless steel snake chain. Besides that, you’ll also find 6 replacement plush ball if you intend to try out different types of essential oil. A couple drops of essential oil will provide you the fragrance for the whole day. 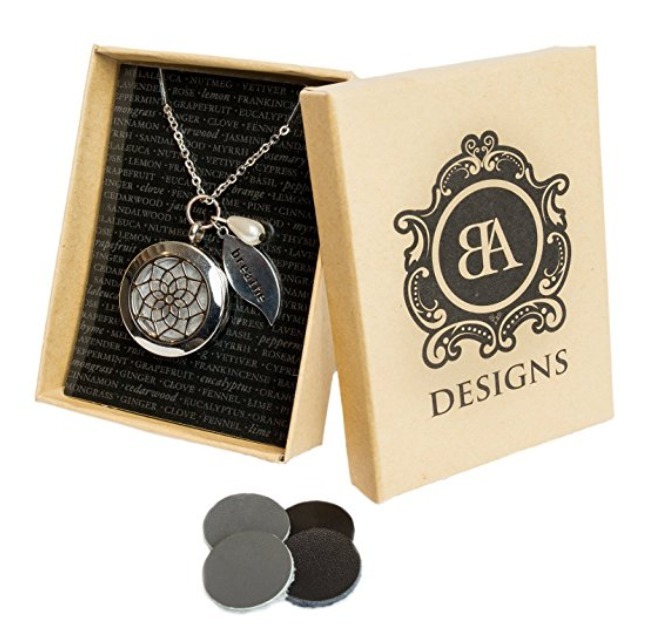 This lovely diffuser necklace also comes in a fitting box. It’s ideal as a gift to your loved ones especially if they can benefit from the therapeutic quality of aromatherapy. The fragrance of the essential oil will calm down their worries in no time. Just bear in mind not to wear the necklace when you’re sleeping or bathing to prevent from damaging it. The same goes for removing the necklace when you’re working out in the gym. Sweat and diffuser necklace doesn’t really go well. Shipped with lava balls and replacement plush ball. Made from surgical grade stainless steel. Lava stone can be noisy as you moved. If you wanted to have a couple of essential oil necklace diffusers and enjoy savings at the same time, consider these pair of aroma healing necklaces from RoyAroma. Both you and your loved ones will get to enjoy the benefits of essential oil while wearing the harmoniously styled pendant. Both the pendants and chain are made from 316L surgical grade stainless steel. They are ideal for people with sensitive skins. The pendants are also lighter than other brands and wouldn’t be too heavy for children. There’s also a solid back and magnetic closure to protect your clothes from being stained by the oil. You can adjust the 23.6″ chain to your liking. The necklaces also shipped with 12 refill pads of different colors. These pads are washable. You can rinse it with regular detergent and let it dry naturally. You’ll also find a cotton pouch to store the necklaces when they are not in use. This will help to prevent the necklaces from getting scratches or dropping on the floor. Be sure to store the necklaces in low humidity area. If you want to introduce personal aromatherapy to your loved ones, getting these necklaces is the best choice. You’ll both enjoy soothing effect of the essential oil just by putting on the necklaces. Magnetic closure and solid back. Some chains are broken after a few uses. 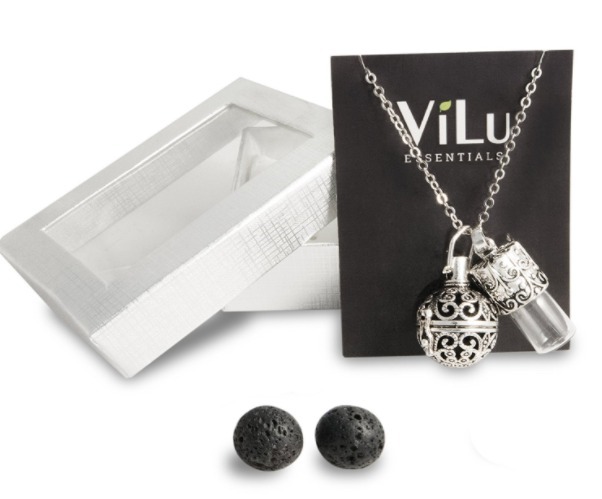 If the scent of a single locket is not strong enough for you, consider getting this diffuser necklace by Vilu Essentials. It comes with a combination of a pendant and a miniature bottle. The locket is meant for the two lava stones that shipped together. 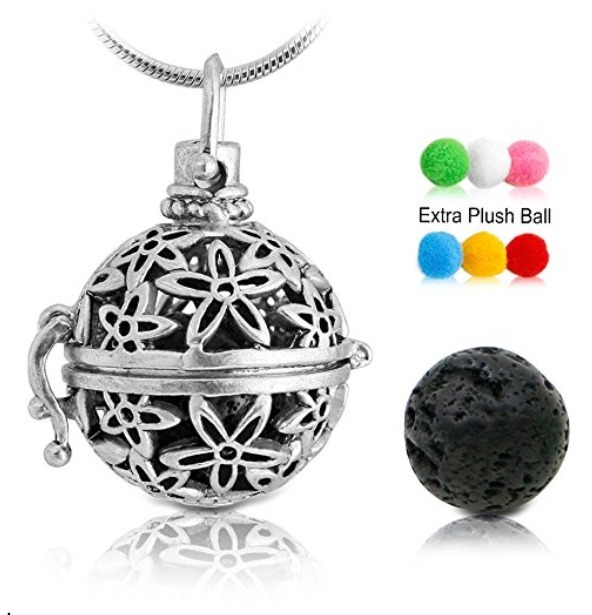 You can place a few drops of essential oil on the lava stone and place it into the locket. If you prefer a stronger scent or a blend of two essential oils, just hook up the miniature bottle as well. You can easily insert essential oil to the bottle with a dripper and it has a small hole on top to channel out the vapor. The material of the necklace is silver plated and may not be suitable if you have sensitive skins. Otherwise, there’s little complain from other buyers when wearing the necklace. Extendable to 28″, the necklace is great for you if you struggle with necklaces from other brands. There’s also a nice looking box that makes it perfect as a gift. If you enjoy the soothing effect of aromatherapy and would love your loved ones to try it. Sending this nicely packed diffuser necklace is the best thing you can do. Not made of surgical grade stainless steel. This essential oil necklace diffuser by Housweety allows you to engrave a short message at the back of the pendant. You can personalize a message when you buy this diffuser necklace. Complete with a velvet gift box, it’s the perfect gift for your loved ones. 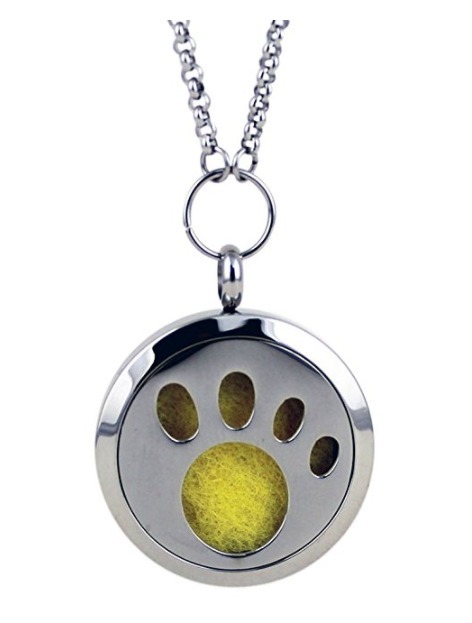 The necklace and pendant are made from hypo-allergenic stainless steel and spot a dull silver tone. It is shipped with 11 high-quality cotton refill pads that can be reused. You can use different pads for a different type of essential oil. It’s worth to mention that the pads absorb essential oil beautifully and there won’t be any leak when you insert the pad into the locket. This speaks highly of the quality of craft involved in producing this diffuser necklace. Your clothes will be safe from essential oil stain with the magnetic clasp on the locket. 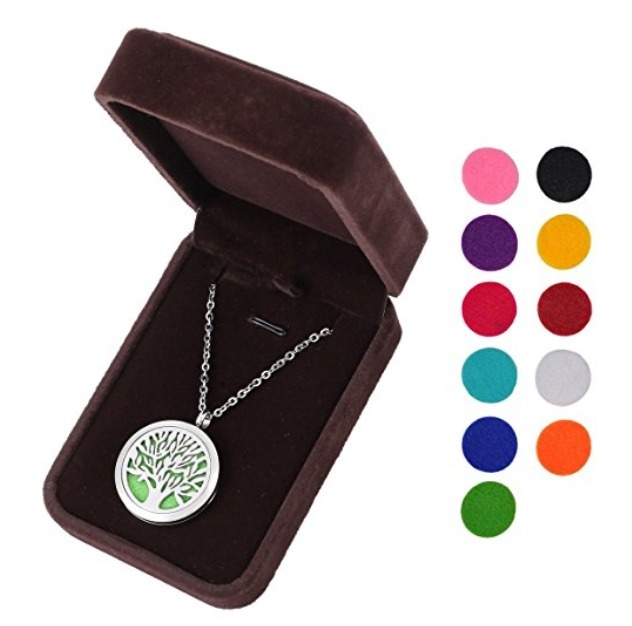 The tree of life design on the locket is simply beautiful when worn on. Besides that, you’ll feel calm as you inhale the floral scent from the essential oil. Comes with a decent gift box. Claps is broken in some purchases. Besides aromatherapy, this diffuser necklace from BA Designs reminds you to breathe, literally. Along with the locket, there are two charms. One bears the shape of a leaf that has the word “breathe” engraved while the other took the form of a teardrop pearl bead. The diffuser necklace is made from surgical grade stainless steel. A round shaped pendant is clasped to an 18″ chain. You’ll find four high-quality non-toxic leather disc shipped together. The discs are where you drop your essential oil before inserting into the pendant. Inserting the pad into the pendant is an easy process. The pendant is secured with a magnetic lobster claw. Simply press your finger between the closure at the side and the pendant will flip open. When you’ve added your favorite essential oil to leather disc, place it on the pendant and secure it. There’s a complimentary gift box that ships together with the diffuser. You may find it handy, both for storing the necklace or as a gift to your loved one. It will help to relieve any stress after a tough day. Two charms accompany the pendant. Comes with 4 leather discs. Surgical grade stainless steel material. If you’re adamant that lava stone is the best diffusing method for an aromatherapy necklace, you have to check out this piece by Sufiniya. It is sold with 6 colorful lava stones that has much superior essential oil retaining capability than leather discs or poms. The chain is made of surgical grade stainless steel while the pendant is produced from brass and plated with high-quality rhodium. The necklace has an antique heart design alongside a retro cross charm. You can a full day of therapeutic healing from the essential oil with this diffuser necklace. Just place a few drops of essential oil on the lava stone and secure it in the pendant. You need not worry about the lava stone dropping off as there’s a strong magnetic closure. The solid back of the pendant prevents your clothes from getting stained. You’ll have a gift box and cloth bag shipped together with the necklace. If you’re not buying the necklace for yourself, it’s an equally good gift idea for your family or friends. This diffuser necklace will be ideal for various occasions like meeting, dating or traveling. Chain broken in rare cases. Elegance and top-notch quality described this diffuser necklace by Aromalove London. It’s made of surgical grade stainless steel and carefully crafted that you wouldn’t find any glue plate stuck at the back. It’s the perfect aromatherapy necklace for your daily usage. You’ll also find the design eye-catching, as the chain is enhanced by the little balls that sets it apart from other diffuser necklaces. Along with the tree-of-life pendant, it will be an enviable aromatherapy that speaks highly of finesse and style. The diffuser necklace comes with 9 micro-weave refill pads that you can wash after usage. These pads are super-absorbent and the scent of the essential oil will last all day long. You’ll also get a velvet pouch that doubles as polishing clothe the necklace. There are also two decorative charms that you can wear together or separately. This set of diffuser necklace will be a great gift idea for various occasions. Your loved ones will be absolutely delighted with arguably the finest quality diffuser necklace in the market. Velvet soft storage bag provided. Rare cases of broken chains. When you got yourself a pretty looking essential oil necklace diffuser, you’ll want to do your best in cleaning and maintaining the necklace. Else it would get discolored quickly and you’ll have to reluctantly purchase a new one. 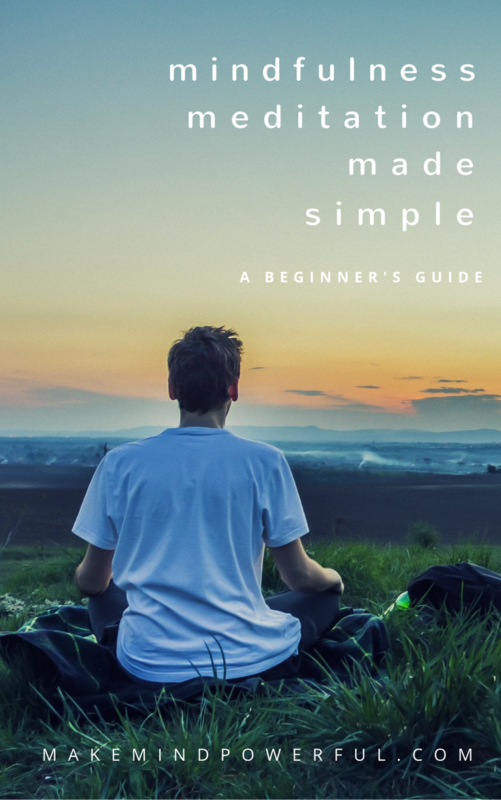 Here are how to do so. Always store your necklace diffuser in a cool and dry area. If your diffuser comes with a pouch, secure it inside before storing it away. This will help reduce the rate of oxidization and keep the shine longer. Clean any silver plated jewelry on the diffuser every 2 weeks with a mild mixture of dish soap and warm water. You’ll want to do that gently with a soft cloth to prevent scratching off the plating. Avoid dropping essential oil directly on the jewelry. Instead, remove the pad and apply drops of essential oil on it before placing it back to the locket. You can also check out more in-depth guides for cleaning your necklace diffuser here. I hope this guide helps you to choose the right essential oil diffuser necklace for your personal aromatherapy. Do you use diffuser necklace for stress relieving purposes? Share your thoughts in the comment below.